“Today marks the beginning of Black History Month, where we celebrate the role that Black Canadians have played in shaping the history, culture, and identity of our province. This month offers an opportunity to learn more about the different voices that contribute to making our province such a great place to live. Ontario is stronger because of our diversity. 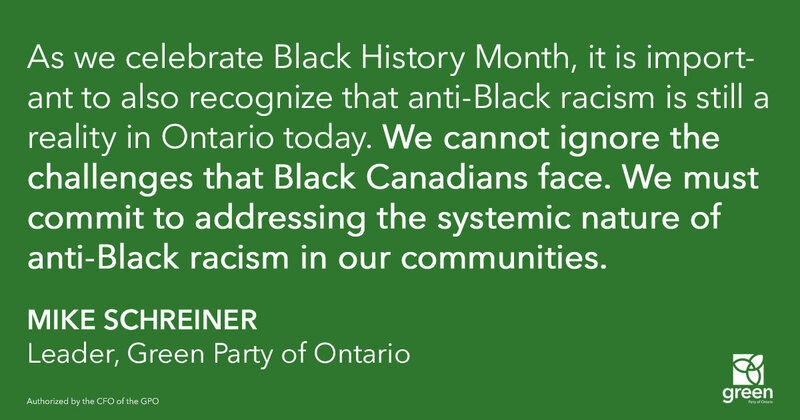 As we celebrate Black History Month, it is important to also recognize that anti-Black racism is still a reality in Ontario today. We cannot ignore the challenges that Black Canadians face. We must commit to addressing the systemic nature of anti-Black racism in our communities. When we reflect on Black history in Ontario, we recognize some of the immense changes that have happened over the span of a few generations. This should give all of us hope to look forward to a future with true equality for all.